Etched and filled stainless steel underperforms Metalphoto® photosensitive anodized aluminum in select applications. Etched and filled stainless steel has historically been used for nameplate, label and panel applications in harsh environments. Engineers have long defaulted to steel under the assumption that it will survive better than other materials. However, Metalphoto photosensitive anodized aluminum is actually superior to etched and filled stainless steel in many applications. 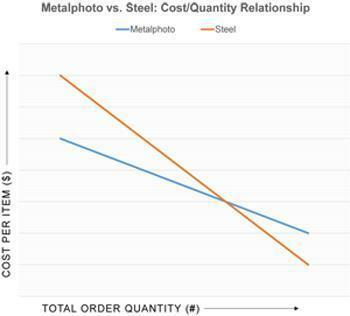 There are five misconceptions often cited about Metalphoto's performance relative to stainless steel – this article explores and debunks each. Durability: Etched steel is the most corrosion resistant label or nameplate material. Legibility: Etched steel plates support detailed, high-resolution graphics. Compatibility: Only steel labels and nameplates can be attched to steel surfaces without corroding. Affordability: Etched stainless steel is always the lowest cost option for durable metal nameplates, labels and panels. Flexibility: The easiest way to produce variable information nameplates is to individually engrave, punch or laser mark steel plates. Misconception 1: Etched steel is the most corrosion resistant label or nameplate material. Stainless steel labels attached to alumimnum or steel containers often show significantly more corrosion than Metalphoto labels attached to the same materials. A major transportation manufacturer of shipping containers saw this phenomenon several years ago and switched from stainless steel to Metalphoto. The reason for this is Metalhpoto's durability, which comes from its photographic image that is sealed inside anodized aluminum, offering the uncommon combination of high durability, image resolution and variable information capability. Metalphoto parts remain readable for more than 20 years, even after prolonged exposure to cleaners, salt spray, fuels, heat, humidity, sunlight and abrasion. The National Association of Graphic and Product Identification Manufacturers (GPI) Industry Standards and Practices Manual identifies Metalphoto photosensitive anodized aluminum as the most durable printed aluminum substrate available, citing its applicability for extreme environmental conditions and outdoor exposure. Misconception 2: Etched steel plates support detailed, high-resolution graphics. Truth: Metalphoto graphics are cleaner and higher resolution than etched stainless steel. Metalphoto is a true, high-resolution photographic technology; unlike etched stainless steel, which is a material removal process. This affords ultra-high image resolution and contrast; making Metalphoto ideal for graphic tolerances other printing methods cannot accommodate. This is especially important for detailed schematics, wiring diagrams, maps, small labels with tight copy or small barcode/data matrix symbols. Etch and filled stainless steel is simply unable to consistently reproduce detailed linear and data matrix bar code symbols. As such, Metalphoto is ideal for high-detail, small labels on small surfaces such as guns, sight and communication equipment. 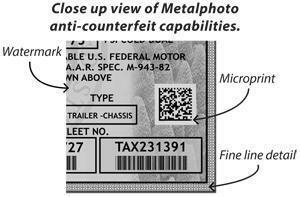 Metalphoto also supports security printing features that make it a trusted deterrent for highly counterfeited products and assets. Misconception 3: Only steel labels and nameplates can be attached to steel surfaces without corroding. Truth: With proper attachment, Metalphoto provides very good corrosion resistance. A common misconception is that attaching an aluminum label to a steel substrate will cause galvanic corrosion. With respect to corrosion resistance, studies by the Norwegian Marine Technology Research Institute (Marintek)3, the U.S. Navy4, and independent laboratories confirm that when coupled with proper attachment methods, Metalphoto provides no risk of corrosion when affixed to steel. The Norwegian Marine Technology Research Institute (Marintek) found that Metalphoto plates showed "very good corrosion resistance" when properly attached to a steel plate and submerged in sea water. Marintek found that a barrier layer of plastic or adhesive would be sufficient to minimize the effects of galvanic reaction. 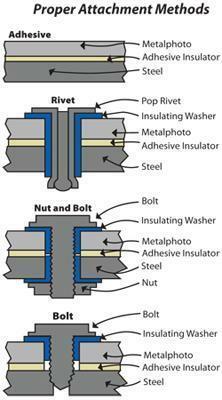 Likewise, when using mechanical fasteners, choose a fastener that is compatible with the attachment surface and fill the attachment holes with edge seal; alternately, separate the fastener with an insulating washer. For information download the Metalphoto Attachment Guide. Misconception 4: Etched stainless steel is always the lowest cost option for durable metal nameplates, labels and panels. Metalphoto requires minimal set-up which allows faster turn-around and fewer labor hours/part — making it ideal for unique, customized parts and/or short production runs. The reason is that Metalphoto's imaging process is less labor intensive than etching and filling steel because it requires fewer steps. 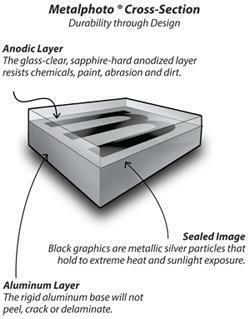 Etching steel requires many steps, whereas Metalphoto only requires three steps: expose, develop, seal. Moreover, at small volumes, steel's extra setup requirements add complexity to the manufacturing process, driving up costs at short-run quantities. Therefore, Metalphoto can be imaged by a single operator — cutting both labor time and cost. The result is shorter lead times and lower cost nameplates. Misconception 5: The easiest way to produce variable information nameplates is to individually engrave, punch or laser mark steel plates. Truth: Metalphoto can easily produce variable information tags tailored specifically to what is needed, without additional punching or engraving. Metalphoto's ability to create hundreds, thousands, even millions of unique labels or nameplates is a function of its unique imaging process. Unlike etching and filling steel, where the many processing steps result in prohibitive costs for items containing unique information, Metalphoto's three-step processing makes it economically feasible to process a high volume of unique data plates. 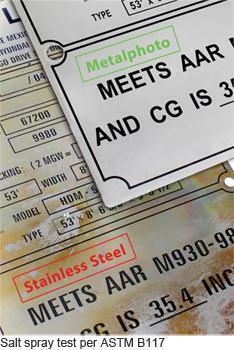 The benefit of this process is that Metalphoto labels and nameplates can contain "item-unique" serialized data, one-of-a-kind instructions and/or barcodes of any symbology. These durable barcodes can connect assets to computer systems, reduce data entry errors and enable asset tracking and management. Additionally, Metalphoto is available with a variety of physical options that etched and filled steel cannot offer. Metalphoto is available in thicknesses ranging from 0.003" to 0.125", and in four different finishes: matte, satin silver, brushed and mirror-like gloss. Metalphoto is also compatible with an array of attachment methods (see Metalphoto Attachment Guide). All these customization options ensure that Metalphoto can meet the requirements of a wide range of applications, and that each Metalphoto part is tailor made for its specific application, perfectly meeting the demands of its intended use. 1 One noteable exception where steel would be prefferable is extremely alkaline environments. 2 Salt spray test per ASTM B117. 3 Marintek Report - Corrosion test of anodized aluminum name plates - Metalphoto. 4 Naval Surface Warfare Center, Corona Division - Label Material Environmental Survivability Test. 5 Based on quotations from manufacturers of both etched steel and Metalphoto. Metalphoto is produced by Horizons Imaging Systems Group, an internationally recognized manufacturer of printable aluminum technologies. Employing a range of processes, the company's state-of-the-art manufacturing lines are located in Cleveland, Ohio, USA. For more information, visit www.horizonsisg.com. Horizons ISG does not warrant the performance of its materials in any environment.